Maybe now people will believe that the catastrophe bond market has recovered fully. After seizing up last year because of the problems at Lehman Brothers and American International Group (AIG) -- and the effects they had on credit markets -- cat bonds got off to a slow start this year. However, the latest bond to come to market, from Travelers (TRV), pushes the 2009 cat bond issuance volume past $3 billion, according to Thomson Reuters.%%DynaPub-Enhancement class="enhancement contentType-HTML Content fragmentId-1 payloadId-61603 alignment-right size-small"%%Insurance and reinsurance companies use cat bonds as a way to move risk off their books. This alternative to reinsurance is preferred in cases where it would be too costly to buy traditional reinsurance or retrocession protection – or where carriers aren't interested in assuming these risks at all. Cat bonds also alleviate counter-party credit risk, a concern for the industry in light of last year's financial crisis, as they are collateralized. The Travelers cat bond, Longpoint Re II, will protect the insurer's property portfolio from U.S. hurricane risk. At $500 million, the bond was upsized from its original amount, a sign of strong investor demand. The two tranches in the cat bond are split evenly at $250 million and are collateralized with Treasury Money Market Funds from Bank of New York Mellon (plus 540 basis points). The only difference between the two tranches is tenor: Class A notes are for three years, and Class B notes are for four. Both are rated BB+ by Standard & Poor's. BNP Paribas (BNPQY) and Goldman Sachs (GS) co-managed the issue. 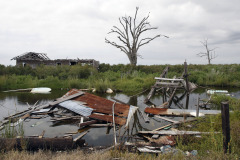 Seventeen catastrophe bonds have been issued so far this year, well ahead of last year's 13, according to data from Guy Carpenter, a division of Marsh & McLennan (MMC). The catastrophe bond market in 2008 effectively shut down in September, as the turmoil in credit markets made it virtually impossible for new structured securities to make it to market. December is usually the busiest month of the year for cat bond activity, so the financial crisis cost the market most of its potential results for the year. Entering 2009, many in the insurance and reinsurance industry were unsure of whether carriers would return to this form of risk transfer. In addition to unease about credit markets, reinsurance rates didn't go up nearly as high as some expected, which meant there was less reason to look at alternatives to traditional risk-transfer tools. Throughout the year, insiders put the estimated result at $3 billion to $4 billion, but 2009 lagged 2008 for the first three quarters of the year, leaving insurers, reinsurers and their investment bankers unsure of the ultimate outcome. With the completion of Travelers' Longpoint Re II, this year's result not only tops 2008 but makes 2009 the third-busiest year in the cat bond market. 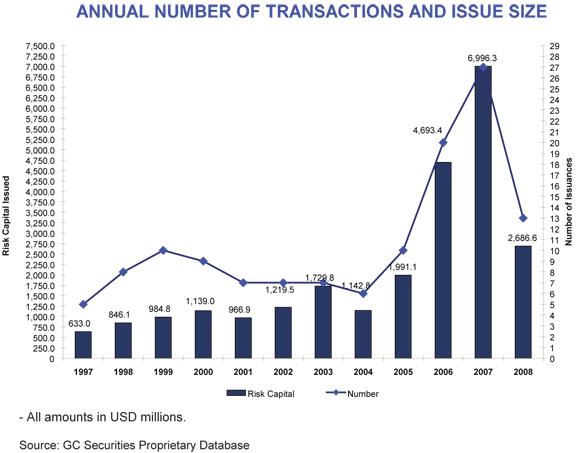 Only 2006 and 2007 had total action above the $3 billion mark -- $4.7 billion and $7 billion respectively. What's in store for 2010? It should look considerably different from 2009, particularly in the first quarter. The first three months of this year consisted of cat bonds that had been pushed from late 2008. The recovery of the cat bond market will likely be counterbalanced by lower costs for traditional reinsurance rates -- an insider at a major reinsurance broker tells me that property-catastrophe pricing will be down 9% at the January 1, 2010 renewal. Declining reinsurance rates usually result in a quieter cat bond market. But, the predominance of repeat cat bond issuers suggests that many carriers have worked these vehicles into their risk management plans. So, we should see insurers and reinsurers remain committed to cat bonds in 2010.